April 03, 2019: If some media reports are to be believed, the Assam AHSEC HS Results will be declared, in May 2019. Most years, the AHSEC HS results are announced around the same time in May 2019. We will update the date and time of when the Assam AHSEC HS result 2019 will be declared as and when the announcement is made by Assam Higher Secondary Education Council, Government of Assam. All students, private and regular, can check their Assam Board 12th Class Result 2019 here on this page. Assam Higher Secondary Education Council (AHSEC) will conduct the Class 12th (AHSEC HS) Examination for the academic year 2018-19 from 12 Feb to 14 March, 2019. The detailed time table can be read here. The Board will declare the Assam Board SEBA HS Result 2019 on the official website (ahsec.nic.in or resultsassam.nic.in) of the Assam Board and on examresults.net website as well. The AHSEC result 2019 can also be check on our Android app. The SEBA results of students appearing for Class 10th boards is also expected to release in the month of May. Assam Board of AHSEC HSE Education has declared the exam dates for the examinations. Assam HSE Examination will begin on 12th February 2019. Assam results will be announced in the month of May 2019. All students, private and regular, can check their Assam 12th Result 2019 here on this page. You can also check your results via our Android app. Students can also join our Facebook group to get exclusive updates about the AHSEC HS result 2019 and other updates. Also Check - Career Option After Class 10th and 12th. How to Check Assam Board AHSEC Results 2019, HS Final Result 2019? Type the desired state name, examresults.net/Assam/. Look for the desired board button, AHSEC Result 2019 Click Here. Click on the link, fill in your Roll Number. Your Assam HS Result 2019 will be displayed. The AHSEC results will include information like your Hall Ticket Number, Name of the Student, Grade Points, and Result. Take a printout of your Assam AHSEC Result 2019. Another way of checking AHSEC results is for students to download our Android app on Google Play Store. Joining our Facebook group will also give you access to exclusive updates on the HS final result 2019. 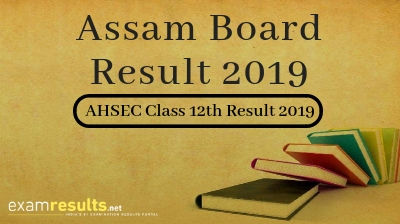 The AHSEC HS exam result 2019 Assam is expected in the month of May. In 2018, the result was declared on 31 May 2018. In 2017, the same results were released in the last week of May, on 30th May 2017. Detailed below are some of the other statistics related to the Assam AHSEC HS board exams conducted in 2018. These stats can perhaps help determine the pattern for AHSEC HS board Assam for 2019. The overall pass percentage of students who appeared in the Assam AHSEC HS exam 2017 was Arts: 74.68%, Commerce: 84.64%, and Science: 85.74%. Approximately 3.5 lakh students appeared for the Assam AHSEC HS boards in 2018. The average number of students slated to appear for AHSEC HS 2019 are approximately the same. The pass percentage and other statistics for Assam AHSEC HS 2019 will be updated once the Assam 12th results 2019 are declared. Where Can You Check Your Assam Boards AHSEC Result 2019, HS Final Result 2019? Students who've appeared for the Assam AHSEC HS exams 2019 can check their AHSEC result 2019 on the official website of the Assam board, ahsec.nic.in, resultsassam.nic.in or on examresults.net. Students can also download our Android app on Google Play Store and check their AHSEC results via the app.Also find Assam SEBA Results 2019 here. The Assam Higher Secondary Education Council (AHSEC) is situated in Guwahati, Assam. The Board is responsible for conducting Higher Secondary (HS) / Class 12 examinations across the state of Assam. This Board is popularly known as AHSEC. The AHSEC HS exams 2019 are to be conducted between 12 Feb to 14 March, 2019 this year and Assam AHSEC result 2019 is expected in last week of May.